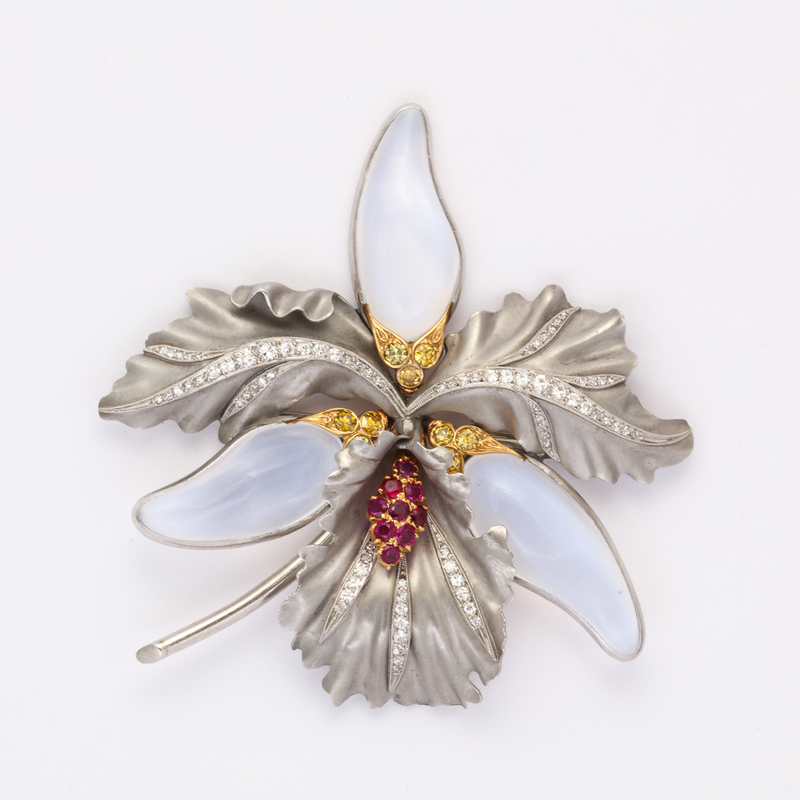 Moonstone, diamond, and ruby brooch in the form of an orchid, set in platinum. By Alfred Philippe, head designer for Trifari and previously worked for Cartier and V.C.A. 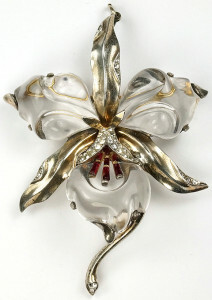 The vintage brooch pictured above bears remarkable resemblance to the “Jelly Belly” orchids designed by Alfred Philippe for Trifari (pictured right), the leading producer of costume jewelry in the twentieth century. In contrast to the platinum, moonstones, diamonds, and rubies in ALVR’s brooch, Philippe’s “Jelly Belly” orchid, patented in 1944, features gilded silver leaves, lucite petals, and rhinestones. 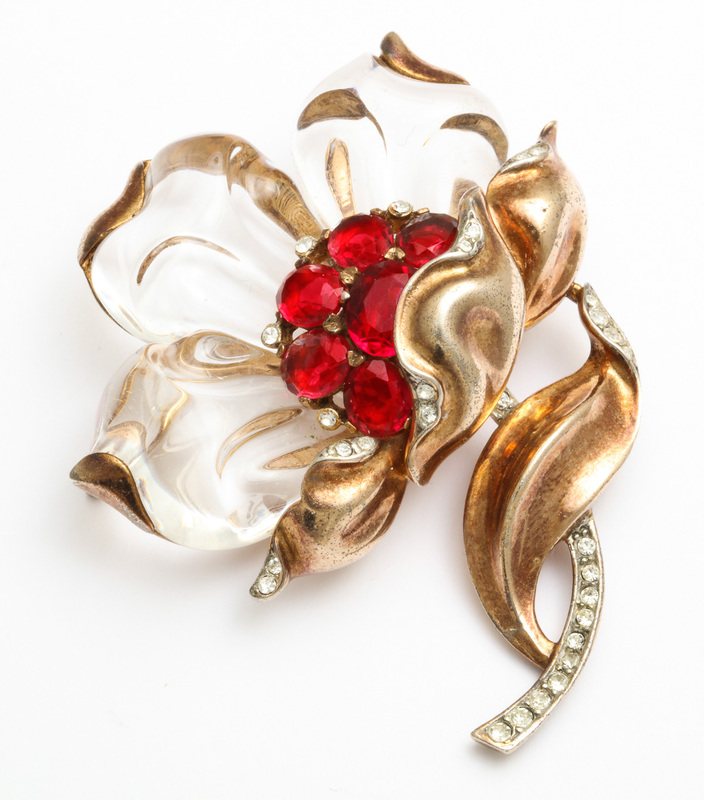 These brooches may differ materially, but they equally demonstrate quality craftsmanship and creative design. These shared characteristics reference a turning point in jewelry history when the Great Depression of the 1930s propelled fine jewelers to lend their skills to the costume jewelry trade. Alfred Philippe was one such designer and the best-known example of the transition. In 1930, after working as a master craftsman for Cartier and Van Cleef and Arples, he became head designer at Trifari where he remained until 1968. His background in fine jewelry elevated his costumed creations to anything but, applying the same high end designs and techniques – like using delicate settings, top quality materials, and setting stones by hand. Philippe applied his expertise to Broadway and Hollywood, creating exclusive designs for stage and screen. But his most famous commissions came from the White House where First Lady Mamie Eisenhower wore Trifari jewels to the 1953 and 1957 Presidential Inaugural Balls. These high profile commissions helped elevate costume jewelry to the same level of its fine counterpart, but we would argue that they are one and the same. In fact, the phrase “costume jewelry” is an anglicized version of the French phrase “bijoux de costume,” meaning, jewelry for a costume. Therefore, whether you’re wearing diamonds or rhinestones, moonstones or lucite, it is all the same: all jewelry is costume jewelry. For all our ALVR Blog posts, please click here. © A La Vieille Russie | Site by 22.